Bali: Morning of the World is a stunning visual representation of one of the most magical islands on Earth. 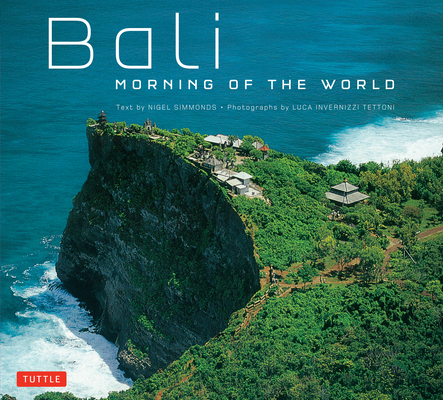 With more than 130 color illustrations by world-famous photographer Luca Invernizzi Tettoni and personal experiences from author Nigel Simmonds, this Bali photography book provides valuable insight into a fascinating culture that has managed to preserve its elaborate and time-honored traditions, even in a fast-changing world. Featuring the extraordinary natural beauty of the island, Bali: Morning of the World portrays both the Balinese people and their home in a cornucopia of color and design and is a perfect souvenir book for those that have traveled to Bali, or those planning on doing so. Nigel Simmonds is an African-born English writer. He has lived in Bali for many years, and co-authored Banda: Islands of Fire and Spice, a book on Indonesia's original spice islands, and Mimpi Manis, a collection of stories from Bali. Luca Invernizzi Tettoni was a world-renowned photographer who lived and worked in Asia since 1973. He specialized in books on all aspects of Asian culture, history, and geography, and was well-known for his photographs in Balinese Gardens, Bali Home, Filipino Cookbook, as well as many spa books published by Tuttle.